Lake Siskiyou with Mt. 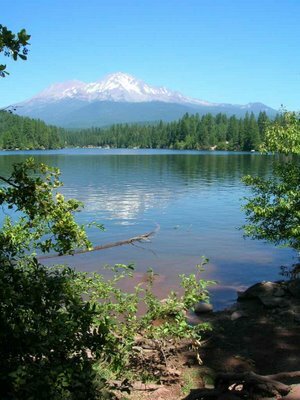 Shasta in the distance. This picture was taken while on an outing yesterday. During the day-in day-out life of the monastery one rarely pauses to reflect on the beautiful mountain scenery close by. I guess that’s because we are in the scenery! Or we ARE the scenery! I was struck by a remark at a lecture yesterday that the world is really “simple”. We can never in a rational sense apprehend it because how and in whatever way we “see” it is a sampling of incomplete data from which we build our map of reality. Another way of mistaking the pointing finger for the moon perhaps, but it’s more than that. You have also hit the entanglement of the observer with the observed (“we are in the scenery”). It’s a beautiful scene – I’ll just take it as offered! Thanks for these two offerings, Tom and Walter. It is late and my ability to think, let alone think clearly, has deserted me. So nothing to say in response, sorry.